Henry H011 "The Original 1860"
The Henry H011 "The Original 1860". Manufacture of this model represents the first American production of a Henry rifle in 150 years. 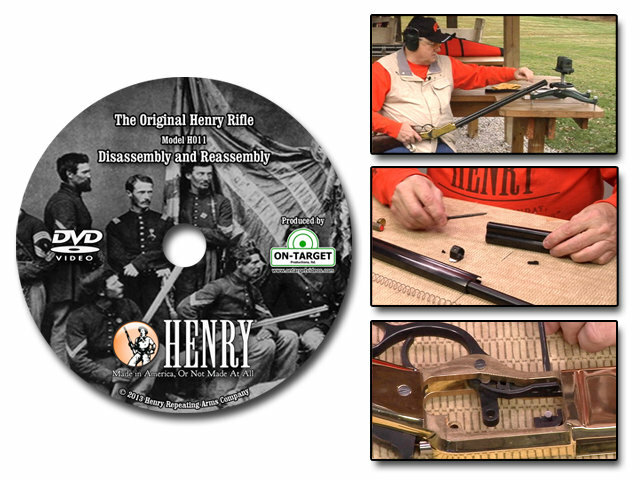 This DVD illustrates how to completely disassemble, clean, lubricate and reassemble your firearm to keep this classic maintained and operating properly. Also on this DVD is a review of the sights, loading and unloading procedures, a trip to the range and a review of how to clean and maintain this beautiful historic rifle. This firearm is fairly simple to disassemble and reassemble, that is, if you are familiar with the firearm and the takedown process. Some parts configurations, though, are more complicated than others. This DVD was designed for the shooter who does not have the experience of the takedown process as well as for experienced armorers who need a refresher course. With this DVD most gun owners can perform the complete disassembly, cleaning, lubrication and reassembly with confidence simply by following the easy to understand instructions. On-Target’s DVDs are digitally produced and provide clear and concise instructions. We at On-Target take great pride in the up-close video of each DVD.